This Friday afternoon at 3pm Muscat RFC are hosting Bahrain in a highly anticipated match at the Bowsher pitch. Muscat have so far been undefeated this season and re-open the season after the Christmas break with this home game against Bahrain. If Muscat beat Bahrain this weekend, and Doha next weekend then they will have secured the league victory for the season and the only objective left after that will be to attempt an undefeated season - something that I'm not sure has ever been achieved in MRFC's 46 year history (it was founded on 26th July 1971). The weather forecast for Friday is overcast or even a touch of rain - perfect rugby playing weather. If you're looking for something to do for a few hours on the Friday afternoon - come down and support Muscat, who are determined to finally defeat Bahrain - something that hasn't happened once in my entire 10 years here in Muscat. Families are welcome - and so are dogs - just make sure you scoop the poop! After the match the post match refreshments shall be taken as usual in MRFC's adoptive clubhouse - The Habana Sports Bar at the Grand Hyatt, Muscat. 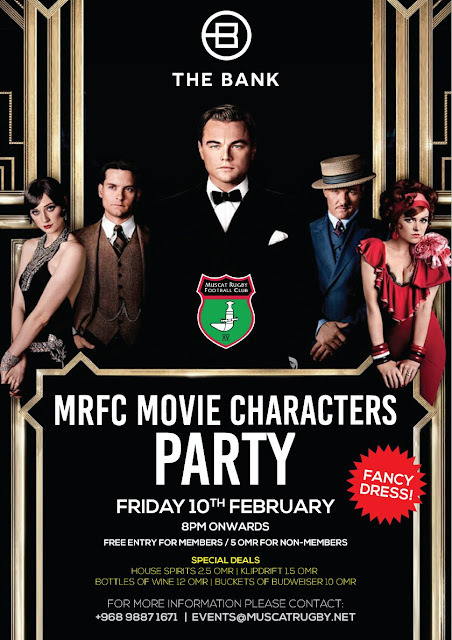 Whilst on the topic of MRFC for a moment, next Friday (10th February) after the Doha game, there is a Movie Characters fancy dress party being held at The Bank - there are specials on drinks and entry is free if you are a MRFC member, or just RO 5 if you are not. People who have attended MRFC's previous fancy dress parties know the score - hundreds of people in fancy dress having a good time, and no entry for those not in costume!